Reese’s Chocolate Peanut Butter Trifle w/Peanut Butter Whipped Cream only looks hard to make! 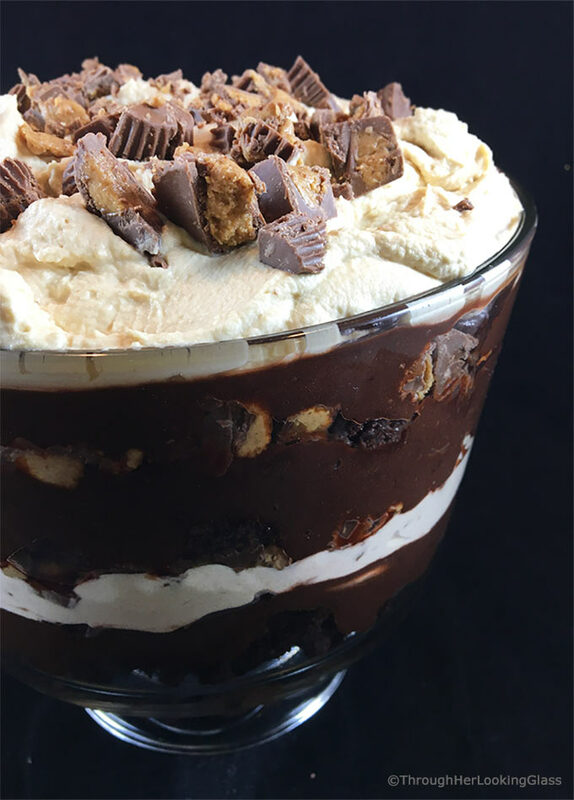 Brownie crumbles, homemade peanut butter whipped cream and creamy chocolate pudding layer with chopped peanut butter cups for an unforgettably easy and elegant dessert. 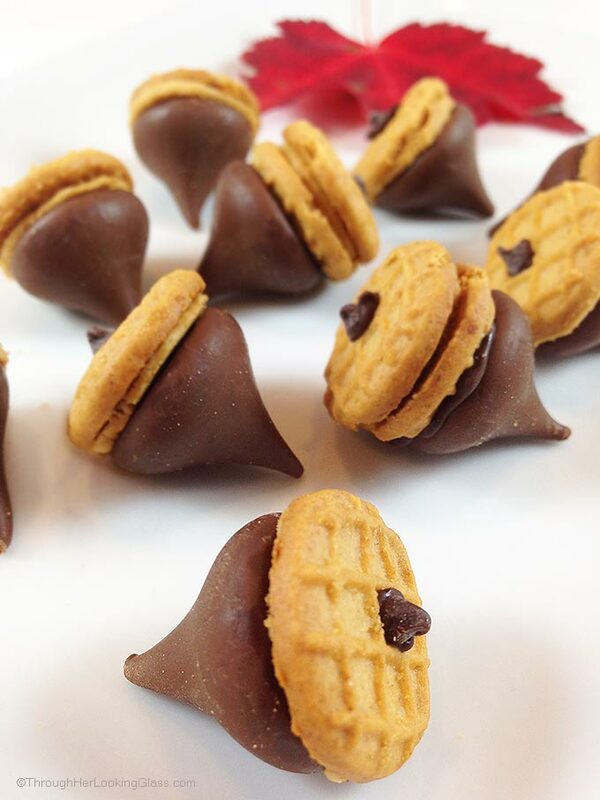 For all the chocolate and peanut butter lovers! The weather is just beautiful in New England today. After a week of clouds and rain, the sun is finally peeking through. I love springtime, seeing all the flower buds and blooms. Finally. We waited a long time around here for spring, and it’s always glorious when it finally does! Springtime is when three of my four baby boys arrived. It’s such a beautiful time of year to take a new baby out walking in the stroller… I loved doing that with each my babies. So spring babies mean lots of spring birthdays in our house. My kids are funny about celebrating their birthdays. Nearly all of them prefer to celebrate with something besides birthday cake! They’ll say things like…. I think it’s the peanut butter whipped cream that makes this Peanut Butter Trifle so fabulous. I love peanut butter cheesecake and peanut butter mousse, so thought I’d give it a whirl. I didn’t actually sweeten the peanut butter whipped cream because everything else is so sweet. And I think the balance is just right, but tell me what you think. So bake up a batch of your favorite brownies. As the brownies bake, whip the whipping cream and peanut butter together. 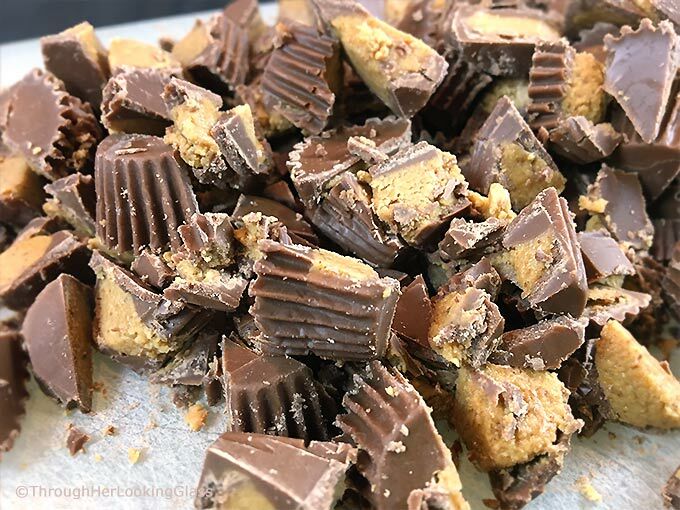 Chop the peanut butter cups. Whip up the chocolate pudding. Make sure to cool the brownies completely. Then layer all the ingredients in a glass bowl or trifle dish. 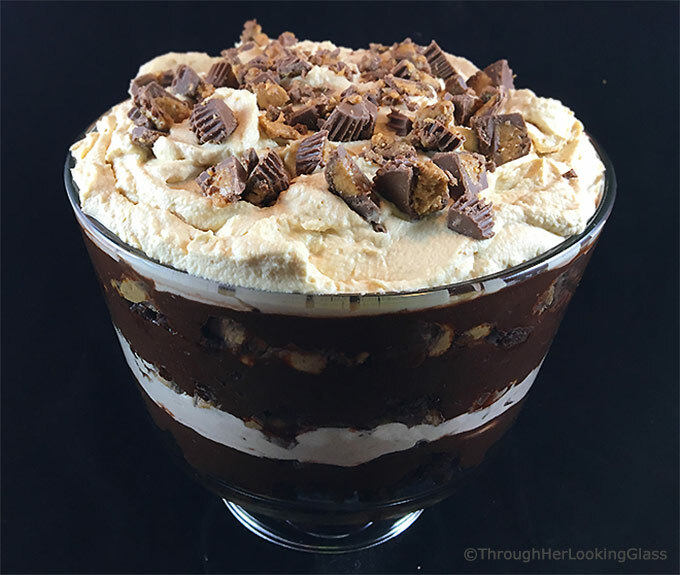 This Reese’s Chocolate Peanut Butter Trifle w/Peanut Butter Whipped Cream is an easy, elegant dessert for any special occasion. Enjoy! If you make this ahead of time, be sure to stabilize your whipped cream. That keeps the trifle from sliding down the sides of the trifle and settling a few inches lower. This dessert needs to stay refrigerated. Use smooth peanut butter in your peanut butter whipped cream. Make sure your brownies are completely cool before assembling. In a chilled metal mixing bowl, beat 3 cups heavy whipping cream, vanilla extract and creamy peanut butter on low speed with hand mixer until combined. Then whip on high speed just until hard peaks form. Set aside peanut butter whipped cream. In glass or trifle bowl, layer all ingredients. Layer these ingredients in whatever order you like. Place 1/3 of brownie crumbles in the bottom. Top with 1 1/3 cups chocolate pudding. Sprinkle on 1/3 of chopped peanut butter cups. Top with 1/2 the peanut butter whipped cream. Add another 1/3 of the brownie crumbles. Top with remaining brownie crumbles. Layer on remaining chocolate pudding. Spread remaining peanut butter whipped cream on top. Sprinkle with remaining chopped peanut butter cups. Girl, you are speaking to me with chocolate and peanut butter. Love this! Love this trifle! All those layers of chocolate and peanut butter and the peanut butter whipped cream sounds incredible! Love how decadent this looks! It sounds so good! Wow! This looks decadently delicious! This was SOO good!! I think it was one of the best deserts I've had! Thank you for making it! And happy birthday to Jacob ? You got chocolate in my peanut butter! Allie, this looks amazing and I can't wait to try it. What time should I be over, lol. I think I'll be making this for our Very Murphy Christmas party this year. Oooo...I think it will be a big hit. There was a drop-in in Bham this past weekend and Laura brought it! Killer. Oh my goodness gracious...and I'm trying to diet!! But if there's anyone that deserves a fabulous treat like this it's Jacob. Happy Birthday, Jacob!! What a wonderful young man he is. Wow, I will definitely have to make this when there are lots of people to eat it up. I can't trust myself alone with this. I completely agree Susie - make this when there are lots of people around to eat it. It was so good though. Thanks for the birthday wishes for Jacob, you are sweet. He had a great birthday and a fun birthday present: a plane ticket to go see his brother!!! One of the things that blogging really changed in my life is my relationship with chocolate. I NEVER used to like anything chocolatey and now I find myself using chocolate more and more in my kitchen and actually enjoying it. I am not sure that is sooo beneficial... :) But when I see such desserts as this one, I can't resist! Yep, I'm a sucker for chocolate through and through, Adina. I hope you are doing great and enjoying October, my friend! I didn't realize your son was a September baby too!!! It was hard being pregnant through a hot summer but September is a great birthday month! The glorious way you named this recipe didn't even begin to prepare me for the mouth-wateringly amazing pictures! Happy belated birthday to Jacob! Oh wow talk about decadence! I'd be all over this trifle - I'm a sucker for anything involving chocolate and peanut butter together. Happy birthday to your son! Allie, I made this for a birthday party last night. It was YUMMY and I didn't have ONE crumb left!!! Hey Debra - glad to hear it. We were in Birmingham for parents weekend at Samford this past weekend w/Jonathan. Some Bham friends had a drop-in for us and they made this dessert! Woo hoo! That is one decadent dessert! Just give me a spoon! Seriously, that would not last very long in my house! yummm drooling here. what a sinful treat. love it. What a dreamy dessert!! I'd need to serve it to company so I wouldn't eat it all myself!! Oh my, what a decadent looking dessert, my mouth is watering! GAWSH - I remember when you first posted this... I STILL want to lick the screen looking at it now! This is spectacular!